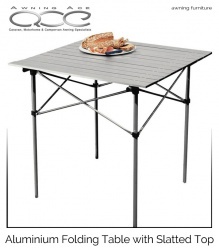 Whether you are having a garden picnic, you're camping or you need another table for when the family come round, this folding table would be ideal. The top is easy to wipe clean and the twin height setting makes it perfect for kids or adults. Colours may vary. 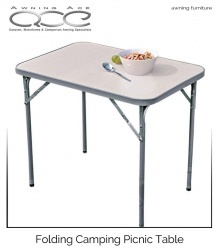 The table top is coated plastic, and the frame is lightweight aluminium. Two heights - 59cm and 69cm. Make the most of your outdoor living space, outdoor event or garden party with the easy to pitch Trespass Camping Event Shelter. 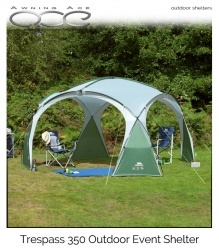 This event shelter package comes complete with all 4 side panels. : 1 x Zipped Door entry panel, 2 x Window panels and 1 x Plain panel. Easy to transport, lightweight and folds away into its own carry bag, this camping table would be ideal for outdoor events such as BBQ's, kids' parties, camping and picnics. Lightweight, square aluminium slatted table with a collapsible frame. 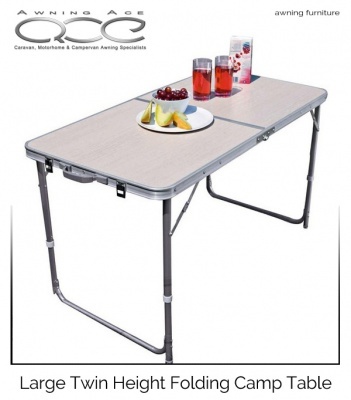 Handy for picnics or camping holidays this portable camping table folds flat and is lightweight. Ideal for sitting to eat your dinner or just using it for storing items on. The top is easy to wipe clean and is perfect for kids or adults. Colours may vary.